Inland Empire time (nothing Empire-ish about it, it’s just Cowtown…) Left in the grand Buick LaCrosse Avenir, a plush luxury Buick with of course the requisite portholes just like a proper Buick. And wood on the dash like a Roller or Bentley. I really wanted and needed to go to the McCall aviation party… a very interesting combination of WWII airplanes, modern biz jets and classic cars, with appetizers and beautiful ladies serving them… but in the zeal to find accommodations, I just didn’t have time… and even then ended up quartered in East Podunk, just far enough away so they’ve heard of Monterey but not Car Week. Endured Route 5’s studied boringness and got to the crossover to Paso Robles where it’s proper green again instead of faded brown. Pulled right into the little village of Carmel, which sort of looks Harry Potterish… oh-so-cute, a contrivance they struck upon even 50 years ago as a way to pull in the tourists. 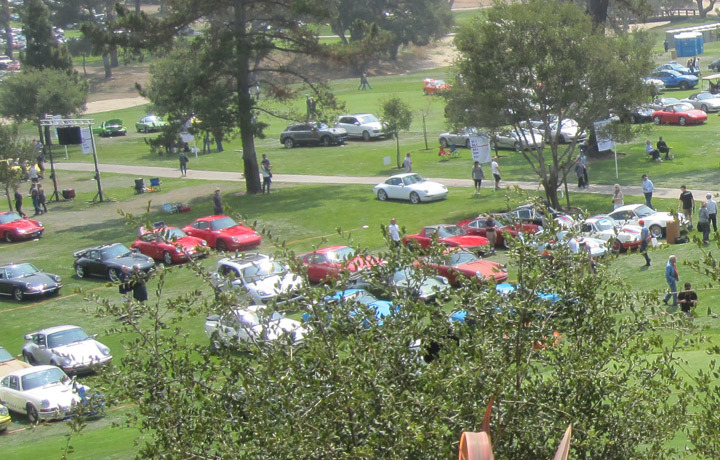 11 a.m. On Thursdays they have the second car show of the Monterey Car Week, this one is sort of part of the Pebble Beach Concours. Turns out that if you are a concours participant, you get points for participating in the tour, points you can use to combat any points you get for an eagle eyed judge spotting something wrong in your restoration, like say, English tools in the tool kit of a German car. I have to say, as an artist, that this show has great potential because there you are: some grand boulevardiers and even full bore race cars being driven around the peninsula only to come to rest in this village where they are surrounded by friendly fans. Once they finish the tour in downtown Carmel, the owners go to a picnic lunch. I enjoy seeing the crowds’ reaction to the cars. 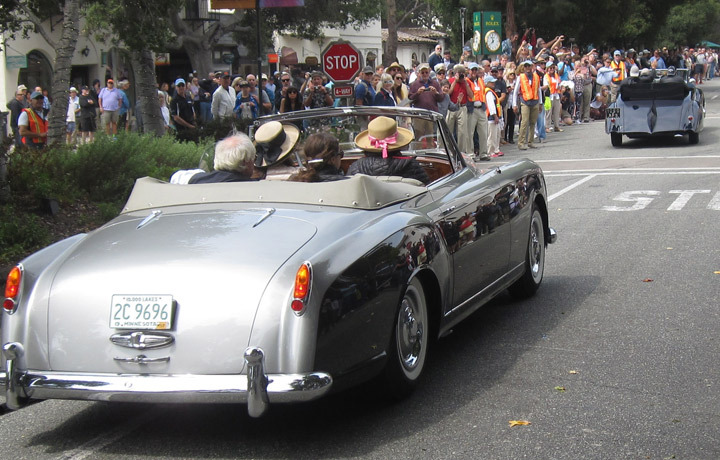 Some in the crowd are “mere tourists” who just happened to be in Carmel when Car Week hit. So you hear comments like “Look, Maude, that there car has a gold lady on the radiator…”. But surrounding this small group is a large and knowledgeable bunch of car folks. 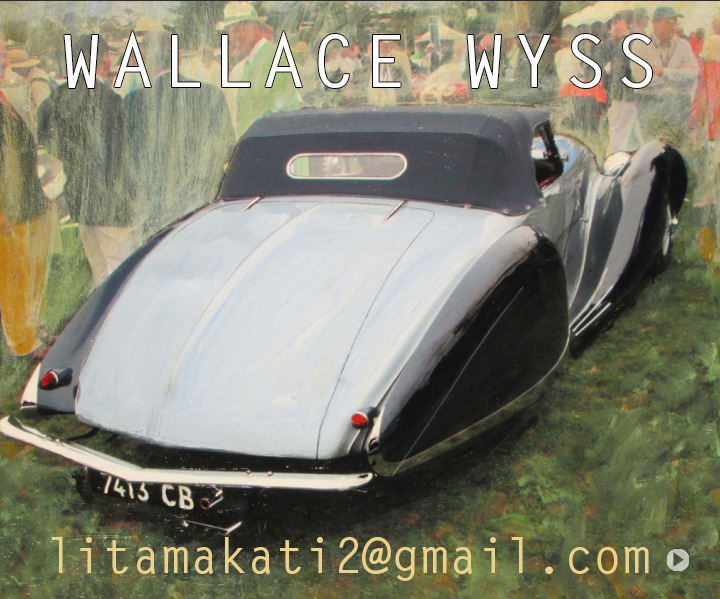 I am equally bowled over by the flamboyance of the art deco of both French and British cars. This year a Daimler drophead caught my eye, although with race cars on show, there was the added music to the ears of a full blooded racing engine. (Noise laws? Gee, officer, didn’t know anything about those…) Hey, the Carmel PD wasn’t writing noise tickets but probably fully occupied yanking away cars blocking driveways! I was lucky I found a spot only 4 blocks south. But be prepared for a walk. Good thing Uber and Lyft exist. If I had a modern phone I could have called them, but alas, I still be a “flip phone” guy, cut off from the modern world. 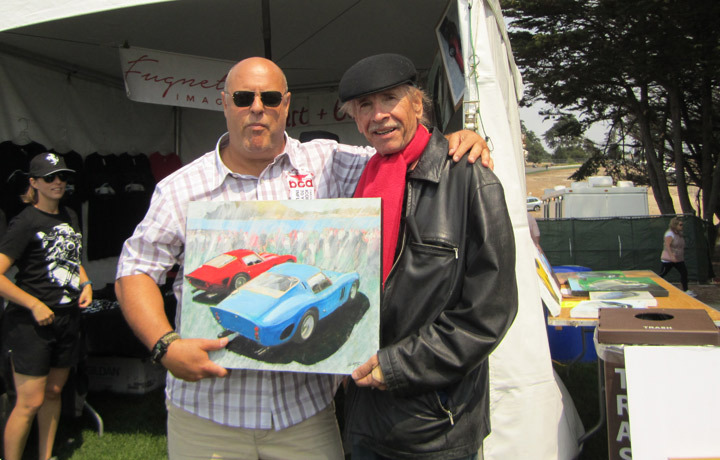 Your humble author moves a canvas--depicting two GTOs--out the door at Concorso! Sometimes I look for visitors who have that "look" to use later in a painting. This couple had it in spades, and bought a print... but I don't know how they carried it home on a Ducati! Later on Thursday we went to Cannery Row to look longingly at fish specialties… but didn’t like the prices. Then we went to Pebble to pick up race credentials and over to the Rolex Revival races. Alas, no “all-area” photo pass so I didn’t take a race shot but did shoot cars in the pits. Here I was entertained by the detailed histories of the cars, some of which have actually been raced for over 60 years. I was surprised to see a genuine Cobra Daytona coupe being raced, these being about $6 zillion at least. I did some grumbling to some mechanic servicing a Ford GT40 X1 telling him that Steele Therkelson swore he was graveside when that car was cut up and interred (so Shelby wouldn’t have to pay customs duties) so how could it be in front of me? Laguna, now called Weathertech Raceway, has a nice midway with the latest car books, interesting T-shirt art, and enough memorabilia for virtually any brand. Ford used the race to roll out a Gulf liveried Ford GT. This could be a good option because in ’06 those that paid the extra $13,000 for the Gulf livery paint job are now apparently reaping the reward with their cars being worth $100,000 over the other 06’s. I ran across Harley Cluxton, an exotic car dealer from Scottsdale, and asked him about the Ford GT X1 I’d seen and told him that I thought it was buried, literally to avoid customs duties. He, a multiple GT40 owner (he bought the one that won Lemans twice) agreed with me that the story is shaky and that if the car ever is presented at a race or auction, this may come up. Then over to Pebble Beach where BMW showed a coupe prototype realistic enough to be next year’s 8 series coupe out behind the Del Monte Lodge. The same evening we went to Acura’s party rolling out a dolled up sports model at a local country club… with wonderful food. Tried to talk to Dan Neil, of the Wall Street Journal but he shushed me up so he could soak in the songs of Jewel, a blonde songstress. Friday August 24th, 10 a.m.
Two German car things: one at a country club where you had to drive down a path only wide enough for golf carts. This resulted in expensive sounding scraping of alloy wheels (sorry, Buick). And I didn’t find the cars exceptionally exciting so I asked “where are the Porsches” and was told “not here” …so then I went to another country club… more driving on paths only meant for golf carts… and more agony for the car’s alloy wheels. You can just imagine the reaction of Porsche owners with $600 apiece wheels. But then maybe they got in the front door and only us spectators had to run the gauntlet. Now ordinarily this space would be filled with a lengthy description of the Friday concours over in Carmel Valley at the Quail, one which I can say from last year’s experience is splendorous in the quality of their displays. Alas, they deemed me not sufficiently important to be issued a media pass (to an event that is over $700) so go ahead and look for it on the net.